Home of the glorious Golden Temple, the iconic city of Amritsar, portrays the heroic character of the Punjab. A day in this peaceful city starts with the spiritual prayers from Gurudwaras. The original name of first the ancient lake, then of the temple complex, and later the surrounding city, meaning "pool of ambrosial nectar." Amritsar is the spiritual and cultural centre of the Sikh Religion. Baisakhi festival brings out Amritsar's resplendent face with its finest food, clothes and merry-making. This place is also famous for its Jallianwala Bagh massacre and its proximity to Wagah Border. The satiating food and generous dollops of legendary Punjabi hospitality further connive to cast a spell upon the visitor. From the Operation Blue Star in the Golden Temple to the tragedy of the Jallianwala Bagh massacre, Amritsar has seen the worst of situations and yet emerged like a phoenix through testing times. Amritsar today is a thriving city with active trade and tourism industries. One of the most agriculturally productive cities of India, Amritsar is well connected with most of the important cities of India. 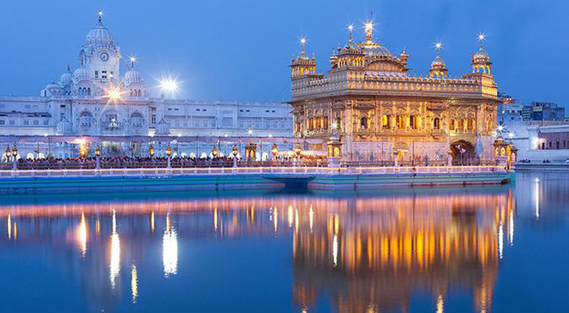 Tangibly the most spiritual place in India, Golden Temple, also known as Sri Harmindar Sahib, is the holiest shrine in Sikhism which is alive with religious fervour and sacredness. It is a place that can only be experienced and not described. Serving as a symbol of brotherhood and equality, Golden Temple is visited by people from all over the globe who come here to seek spiritual solace and religious fulfilment. Although the Golden Temple itself is of great historical and architectural interest, it is the view of the resplendent shrine, glistening in the centre of the tank, bringing an infinite calmness that is most memorable to a visitor. Located in the beautiful city of Amritsar, Golden Temple is just a small part of the vast complex known as Harmandir Sahib or Darbar Sahib to the Sikhs. The spiritual focus is the tank, the Amrit Sarovar, which surrounds the glistening central shrine. Amritsar takes its name from this Amrit Sarovar which was excavated in 1577 by the fourth Sikh guru, Guru Ram Das. The Hari Mandir (central temple) is connected to the pathway by a marble causeway which is known as Guru's Bridge. This path symbolises the journey of the soul after death. Embraced by marble stairways, this tank is believed to have healing powers that can cure many diseases. The pilgrims gather at this place of mesmerising beauty and sublime peacefulness to listen to hymns and pay obeisance to the Guru Granth Sahib (the holy scripture) which is read here. The golden structure is a sight of beauty and awe, and despite the regular mantra recital; this place is incredibly intriguing and very peaceful. Around the edge of the compound, there are more shrines and monuments. The Sikh Museum is located inside the main entrance clock tower which shows the oppression endured by the Sikhs at the hands of the Mughals, the British and the Indian Government of 1984. The Ramgarhia Bunga is a protective fortress located at the southeast end of the tank. This fort is surrounded by two Islamic-style minarets. Golden Temple is indisputably one of the most exquisite attractions in the world. Located near the famous Golden Temple of Amritsar, the Jallianwala Bagh is a public garden which houses a memorial to commemorate the massacre of peaceful celebrators by the British forces. The tragic incident had left a deep scar on the country, and a memorial was constructed post the independence for the innocents who lost their lives in this devastating incident. Established by the government of India in 1951, the massacre memorial was inaugurated by Dr Rajendra Prasad on 13th April 1961. The place has been turned into a beautiful park and is managed by the Jallianwala Bagh National memorial trust. Spread over 6.5 acres of land, Jallianwala Bagh is associated with one of the saddest days in Indian History when thousands of innocent people were killed on the orders of General Dyer. There is a narrow lane between the houses which lead to the lawn of the park. There is a memorial tablet at the entrance which serves as a record of history. A number of structures are present inside the premises which resound of the atrocities that occurred here. These include a wall which still bears the marks of the bullets that were hurled blindly at the civilians and a well in which many people jumped to save themselves from the onslaught of the bullets. It is estimated that over a 1000 Hindus, Muslims and Sikhs lost their lives in this brutal assault. A memorial in their remembrance has been installed here as well. Wagah Border is the border line running along the Grand Trunk Road between Amritsar in Punjab, India, and Punjab in Lahore, Pakistan. People from all across the country visit this place to witness the Beating Retreat Ceremony that is held every day before sunset. This ceremony includes the closing of the international gates and lowering the flags of both the countries. The flag ceremony is conducted by the Indian Border Security Force and Pakistan Rangers since 1959. The Wagah Border is located at a distance of 22 km from Lahore and 28 km from Amritsar. Every evening, just before the sunset, the soldiers from the Indian and Pakistan military meet at this border post to engage in a 30-minute display of military showmanship. Officially, the purpose of the ceremony is to formally close the border for the night and lower the national flag. However, it is an entertainment ceremony and a patriotic display for the thousands of people who come here every day. During the build-up to the ceremony, the crowd witnesses national anthem chanting, rounds of applause and Bollywood-style dancing. People from both sides visit the Wagah border. The crowd is more on the weekend with people sitting in the stands and applauding the soldiers performing the ceremony. Seating arrangements are enabled for the spectators so that they can watch the ceremony. On both sides of the border, there is a massive gate which is inscribed as "Swarn Jayanti Dwar". A panoramic landscape of Wagah can be witnessed by climbing on top of this gate. Visiting the Wagah Border and experiencing the Beating Retreat ceremony is utterly gripping, one which leaves you full of pride and patriotism! Offering electronic items, ornaments, best quality books, handicrafts and ready-made garments, Hall Bazaar is famous for its Mughal style gate, complete with a giant clock with caption "Amritsar - Sifti Da Ghar". The sacred shrine of Mata Kaulan, also known as the Gurudwara Mata Kaulan, is located on the west side of the Golden Temple in Amritsar. The memorial was named after Bibi Kaulan, a holy lady who was raised as a Muslim but then adopted Hinduism later in her life, becoming a faithful disciple of Guru Har Gobind. Bibi Kaulan?s father disowned her and pronounced her dead for her devotion towards Guru Hargobind Ji. After she was abandoned, Sant Mian Mir, a resident of the same village, secretly brought her to Amritsar, where she spent the rest of her life devoted to Guru Har Gobind while performing religious duties. She was later laid to rest in the western area of Gurudwara Kaulan. Bibi Kaulan's Kirtans, which she sang religiously every evening, are still remembered by the older members of the Sikh community. Bibi Kaulan?s service to the Gurudwara and devotion towards Gods is often praised in the temple complex. Kaulsar Sarovar, located next to the Gurudwara Mata Kaulan, is the holy place Guru Hargobind advised devotees to take a dip in before proceeding towards the Amrit Sarovar. Kaulsar Sarovar, the first tank in Amritsar to be named after a Muslim woman, is the perfect spot for tourists to feel a sense of tranquillity and indulge in some introspection and meditation. Summer palace turned into museum, Maharaja Ranjit Singh Museum is a lovely building which archives the Royal Heritage of Maharaja Ranjit Singh such as arms and armour, outstanding paintings and century old coins and manuscripts. The palace is surrounded by the famous Rambagh Gardens popular for its statue of the legendary king with his horse. Bibeksar Sahib lying on the banks of Bibeksar Sarovar was constructed by Maharaja Renjith Singh. The place is famous as the congregation site of followers of 6th Sikh Guru, Hargobind Singh ji. The Partition Museum, the first-ever museum in the entire world to focus on the stories and trauma of the millions who had to suffer from the bloody consequences of a ruthless partition; was recently opened up at Town Hall in Amritsar. Developed by the Arts and Cultural Heritage Trust (TAACHT), the museum is a part of the newly inaugurated Heritage Street at Amritsar, which begins from the Golden Temple and ends at the Town Hall. Collections at the Partition Museum include newspaper clippings, photographs as well as personal items that were donated by people who had witnessed and lived during the Partition. TAACHT aims to establish the Partition Museum as a world-class physical museum which is dedicated to the memories of the Partition of the sub-continent in 1947. The museum is devoted primarily to the Partition's victims, survivors, and its lasting legacy. The Partition is undoubtedly one of the most brutal episodes in the Indian history, which witnessed the displacement of twelve million people to an altogether new homeland, and the painful demise of two million people! Of course, such an aching and moving incident left behind many memories, which are excruciatingly painful and valuable at the same time. Still, there has always been silence about the Partition, and this is what made the development of such a museum extremely necessary. The Partition Museum has been visited by thousands of visitors ever since its inauguration. The list of visitors includes members from either end of the spectrum and comprises of school children, local families who were affected by the Partition, and also domestic and international tourists who visit Amritsar to witness the Golden Temple. Akal Takht (Throne of the Immortal) is the highest political institution of the Sikhs, founded by the sixth Sikh Guru, Guru Hargobind in 1606. Located in the famous Golden Temple complex of Amritsar, the Akal Takht is one of the five Takhts of the Sikhs. These Takhts are seats of power and authority among the Sikh community, and the place of the Jathedar, the highest spokesmen among them. The Akal Takht is meant to be a symbol of political sovereignty and justice, where the spiritual and earthly concerns of the Sikh people could be addressed and examined. Situated directly opposite the Harmandir Sahib, this creation was originally a 9-foot high concrete slab built by Guru Hargobind, Baba Buddha and Bhai Gurdas without any external help. The two tall flags symbolise the two swords of Guru Hargobind representing his spiritual authority (Piri) and earthly power (Miri) by the Akal Takht.Today, the structure is a modern five-story building with marble inlay and gold-leafed dome. The marvellous construction has been compared to the famous Piazza Saint Marco in Venice. The elevated platform inside stands as a symbol of rebellion against Emperor Jehangir, who had ruled that only an emperor can sit on a raised platform. Devotees can witness the Guru Granth Sahib being carried from the Golden Temple to the Takht at night, an age-old tradition practised at this site. Guru Arjan Dev used to sleep under the cot meant for the Guru Granth Sahib, now known as Kotha Sahib. Found within the famous Golden Temple complex, the Dukh Bhanjani Ber Tree is considered the most sacred tree in Amritsar. The 400-year-old jujube tree, situated on the eastern side of the great Amrit Sarovar, is greatly revered by Sikhs due to the legend and faith of Bibi Rajni, whose leprosy stricken husband was miraculously cured after a dip in the pond close to the tree. It was then named Dukh Bhanjani which means 'eradictator of suffering'. The first Sikh Guru, Guru Nanak is said to have rested at this holy spot while singing Gurbani in deep devotion to Waheguru. It is considered greatly instrumental in the founding of Amritsar by Guru Ram Das Ji, the fourth Sikh Guru. The sacred pond in the Golden Temple Complex, believed to be the holy pond of healing prophecised by the third Sikh Guru Guru Amar Das Ji, was developed into the famous Amrit Sarovar. The city of Amritsar was named after the same. While the access to the Amrit Sarovar is restricted, a small portion of it next to the Dukh Bhanjani Beri Tree is available to devotees who wish to take a dip in the holy water. Visitors to the Golden Temple believe that doing so would cure them of their pain and afflictions and that they would receive blessings from the sacred tree. The devotees aren?t allowed to pluck the fruits of Dukh Bhanjani Ber Tree, but there is no restriction on collecting fallen ones as ?Prashad?. Gobindgarh Fort echoes the grand stories of Punjab's past. The historic fort represents the glorious past of 257 years, starting with the Bhangi Misl era and ending with the Indian Army after The British East India Company. Gobindgarh Fort was first known as 'Bhagian da Qilla' built by Gujar Singh in 1760's. Visitors can tour the area which has now been extraordinarily developed into a live museum, acting as a repository of Punjab's History. The Tokshakhana which is now a museum in the fort was used to store the famous Kohinoor diamond. Maharaja Ranjit Singh enhanced the majestic fort, adding elements which were influenced by the French architecture. The alluring monument was opened to the public on 10 February 2017 after being restored by the Government with the help of the Asian Development Bank. A visit to this marvel is a one of its kind experience, with camel rides, traditional folk performances and at nightfall has a special recreation of history through a 7D laser art show. The bungalow, one of the attractions at the fort, used to serve as a residence to Garrison Commanders during the British era. Visitors can end their visit to this magnificent fort by enjoying some authentic Punjabi cuisine at the Ambarasi Zaika or choosing to buy souvenirs and gifts in the Haat bazaar inside the premises. Khalsa College is a 124-year-old college in the city of Amritsar, making it a historic educational institution in India. The 300-acre campus has acquired the status of the highest Sikh institute for education with an enriching environment and a progressive outlook towards society. The architectural wonder is built on the same location that Guru Hargobind won his very first battle. Architecturally identical in nature, the Khalsa College in Amritsar and Lahore were constructed in the Indo-Saracenic style with influences of the traditional Indian and Mughal architecture. This historic institution was initially set up to conserve and promote the cultural heritage and language of Punjab. The aim was also to bring about social transformations by providing access to quality education. The college was designed by Bhai Ram Singh, who was the principal of Mayo Scool of Arts, Lahore. Over the years Khalsa college has become Bollywood's favourite shooting destination, be it the famous court-room scene of Veer Zara, Rab Ne Bana Di Jodi, Junooniyat with Pulkit Samrat in the lead or Aishwarya Rai Bachchan's Sarbjit. Many filmmakers have replicated the architectural style of the college into studios as movie sets. Vistors who wish to see the college need to take prior permission from the authorities. Mata Lal Devi Temple, popularly known as Sheesh Mahal of Amritsar, is famous among the Hindu pilgrims for its miraculous fertility-improving powers. The temple is dedicated to the female saint Lal Devi and is considered a miniature dimension of the popular Vaishno Devi temple in Jammu. The temple is decorated with shining mirrors that light up the area through the reflecting sunlight and numerous diyas. The idols of various Gods are placed on the inner walls of the entire complex. As devotees walk inside the temple many artefacts, idols, statues, paintings tell the story of Saint Lal Devi. A man-made cave leads the pilgrims to the Goddess's shrine which can be reached only by crawling or bowing completely. Women from across the country visit this mystic temple in order to seek blessings to bear a child, as the mysterious temple is famous for having amazing abilities to improve fertility among women. This fascinating temple is a complete visual treat for tourists as the place has a vivid spectrum of colours and one can truly adore the elaborate mirror work. Punjab State War Heroes Memorial and Museum showcases the fabulous Bravehearts of Punjab. The museum immortalizes the bravery of the soldiers of Punjab, displayed throughout with a spirit of patriotism. Built in both a traditional and modern architectural style, it houses a state-of-the-art gallery where Punjab's martial tradition and military campaigns can be viewed. Numerous illustrations, photographs, paintings, artefacts, weapons and interactive panels can be found here, letting the tourists go back in time. The museum has a collection of photographs of the 1965 and 1971 war. A mural has been built to commemorate the work and pay tribute to the 21 Sikh soldiers who were martyred in the 1971 war. Much like the Gobindgarh Fort, the walls are constructed with the Nanakshahi brick. Tourists can travel back 3 eras, through the pre-British, British and post-independence periods with the special light and sound show organised here. The 7D auditorium is a must-do experience during your visit here, transporting visitors to the war zones of the past. With its proximity to the Indo Pak International border, the museum is a prime attraction for tourists before the Beating Retreat ceremony at the Wagah border. The chief appeal of this fascinating museum is the 45-metre stainless steel sword preserved at the centre of the place. The sword represents the strength and courage of the people defending the nation at the peak hour of war. The glorious sword is placed on a water body with 3500 martyr names inscribed on the memorial wall. The decommissioned aircraft carrier ship MiG-23, INS Vikrant, and 3 tanks are also exhibited here. Not only does this place serve as a tourist destination, but the museum also stands as a constant source of inspiration for the youth and a reminder of the sacrifices for freedom. Khair-ud-Din Masjid, situated in the Hall Bazaar, is one of the most admired religious centres in Amritsar. Famous among the locals as well as the tourists, this beautiful mosque was built by Muhammad Khairuddin in 1876. This holy place is the site, where Tootie-e-Hind, Shah Attaullah Bukhari raised his voice against the British rule. Durgiana Temple, also known as Lakshmi Narayan Temple, is a Hindu temple located in the city of Amritsar. It bears a stark resemblance to the famous Golden Temple while also carrying the same sense of peace, tranquillity and spirituality. Within this historic temple lies a beautiful Sarovar where one can find idols of Goddess Lakshmi and Lord Vishnu floating. These idols are greatly revered and worshipped by pilgrims, making this temple a famous Hindu pilgrimage spot. Gur Shai Mal Kapoor, whose statue can be found at the main entrance of the temple, laid the foundation for this architectural wonder. The rare sculpture of the sitting Hanuman, considered one of a kind, is found in Durgiana Temple. One of the main highlights at this serene location is the fountain show which takes place in front of the main temple every evening. Apart from the main temple, one can find many subsidiary temples at this sacred site. The Bara Hanuman Mandir where Hanuman was said to be captured by the twins of Rama and Sita. Mata Sitla Mandir which is dedicated to Sitla, who sits beside a Shiva Linga and a brass lion. Idols of Sat Narain and Radha Krishna can be found in the premises of the Sat Narain Mandir and the Goswami Tulsidas Mandir is dedicated to Tulsidas where one can find a rare handwritten copy of the Ramayana. The temple ensures that visitors are taken care of during their visit to this holy place. One can rest at the "Shrimati Dhanwant Kaur Dharamshala" which is located in the temple periphery. Langar Bhawan, run by the Durgiana Management Committee, serves pilgrims throughout the day. The committee is also known for reaching out to the society through various services to help uplift the needy and being the pure representation of faith. Goindwal Baoli is a step-well constructed in the 16th century by Guru Amar Das. The Baoli (open-well) is located on the banks of the River Beas and is an important Sikh centre. It is considered one of the first Sikh pilgrimage sites. Goindwal is said to be the birthplace of Guru Arjan Dev thus granting it great religious significance among the Sikh community. The well was built after the Sikhs were denied access to the River Beas. The stairway leading to the sacred well consists of 84 stairs, with each step symbolizing the 100,000 life forms to represent the 8.4 million different existences of the planet. The stairways have been divided into 2 pathways, one for male and the other for female. Vistors enter the area through a pointed archway where they can see the walls adorned with multicoloured floral designs and portraits of the Ten Gurus. The fresco work on the walls visually depicts the life of Guru Amar Das. The lotus dome that covers the historic well has a gold plated pinnacle and intricately decorated domes around it which resemble the dome of a Gurudwara. Devotees also can donate marble slabs for the steps as a token of respect. It is a tradition among the visitors to recite 'Japji', as there is a belief that the recitations will bring them liberation from the circle of life. The well is also said to be the place where one can attain Moksha and Mukti after having a dip or even a small sip of the holy water. After the climb, the pilgrims can eat at the langar that serves visitors throughout the day. Gurudwara Bir Baba Budha Sahib, also known as Bir Sahib, is where Baba Budha Ji spent most of his life. Baba Buddha, who lived for 125 years, was the first Granthi, blessed by the first Sikh Guru Guru Nanak Dev as a boy, and went on to anoint the five succeeding Gurus. The Gurudwara complex, situated in the village of Thatta 20 km south of Amritsar, was built by Baba Kharak Singh to Honor the great Baba Budha. On the way to the Gurudwara, tourists can see the rich green paddy and wheat fields of Punjab, giving them an essence of true rural Punjab. Inside the Gurudwara, the holy Guru Granth Sahib is placed on a canopied seat made of white marble. Devotees come to this Gurudwara to seek blessings from Baba Buddha in hopes of a child, as was the case with Guru Arjan Dev, the fifth Sikh Guru, who came to Baba Buddha in hopes of being blessed with a child. Legend has it that Baba Buddha used to live in the jungle outside Amritsar, spending most of his time looking after 'Bir'. Guru Arjan Dev, who was childless for many years, along with his wife Ganga Devi went to seek Baba Buddha’s blessings, offering him many delicacies which he refused. Mata Ganga then prepared Missi roti and an onion and visited Baba again after which. Impressed with the hospitality of the couple, Baba Buddha Ji gave them his blessings, shortly after which they were blessed with Guru Hargobind Singh Ji. Baba Buddha is said to have guided Guru Hargobind to use ammunitions after his father Guru Arjan Singh was martyred by Mughal emperor Jahangir, transforming the Sikh community into a martial race. The Gurudwara, in honour of the meal prepared by Mata Ganga, still serves Missi roti and onion as Prashad. Near the Gurdwara in a separate compound, there is a two-storied residential block, the Guru Ka Langar and a large dining hall. Each Bikrami month devotees in large numbers attend the celebrations, making it the biggest function of the year at this historic site. Gurudwara Chheharta Sahib is a Gurudwara in the village Chheharta Sahib, located 7 kms away from Amritsar. It was named after a massive well dug by Guru Arjan Dev to mark the birth of his son and successor Guru Hargobind. Due to the abundance of water, six Persian wheels were installed around the well to draw water at a faster pace, thus giving the name Chehharta. Although the well is now covered up, the water used to be pumped into the main tank of the Gurudwara. The well is believed to have curative properties and tourists can still see the Persian Wheels which have been preserved well. A local community now manages the Gurudwara, where a lotus dome encloses the square sanctum. The Gurudwara complex also consists of a divan hall and all-day langar where visitors can enjoy a meal as they visit this fascinating site. Basant Panchami in the month of Magh attracts lakhs of devotees from around the country and is considered the most significant fair at this historic site. The festivity begins early in the morning with the Kirtan Darbar which goes on throughout the day, ending in the afternoon the following day. Kite-flying is a significant attraction of this festival, and there are many competitions held for the same. Vistors of this fair can find many men sporting the yellow turban during the festival. The local Gurudwara management organises free medical services during this occasion. Harike Wetland & Bird Sanctuary is the largest wetland in North India. This man-made wetland spreads into Tarn Taran Sahib, Ferozepur and Kapurthala in Punjab, making it a famous destination for bird watchers and nature enthusiasts. Tourists can spot up to 7 species of turtles including the endangered Testudines turtle. The previously extinct Indus dolphin was recently seen at Harike Wetland, giving visitors a rare opportunity to catch a sight of these beautiful creatures. Mongoose, WIld boar, common jackal and jungle cat are easy to spot in the area. The Wildlife Department has constructed earthen mounds with trees in order to increase nesting sites for birds. 45,000 ducks have been recorded to have migrated here during the peak season. Winter season is a treat for bird watcher as 200 species of birds including the cotton pygmy, goose, tufted duck, yellow-crowned woodpecker and yellow-eyed pigeon visit the wetland. Visitors are advised to carry Binoculars in order to catch a glimpse of these spectacular species. Boat rides are pleasant in the evenings and tourists can also stay overnight in the Forest Rest House. Tourists are requested to take prior permission from the forest officials before entering the park and are requested to follow the speed limit. The Shri Ram Tirth Temple, located near Amritsar city, was built to honour the birthplace of Luva - Kusha, twins of Rama and Sita. Constructed in lime yellow stone, the temple dates back to the epic of Ramayana where Sita was given in the Ashram of Balamiki after being abandoned by Rama. The battle of Ram's Ashwamedha force with Luv-Kush is said to have taken place here. The gurukul of the twins, situated in the temple compound, is regarded as an architectural wonder by pilgrims. The ancient temple organizes a 5 day fair a fortnight after Diwali, where almost one lakh pilgrims visit to seek blessings. Devotees take a dip in the ancient tank next to the temple on Purnamashi night. A tradition called Tulla Torana is practised where light lamps made of kneaded flour and ghee are released into the water on Purnamashi night. The practice of this tradition is said to wash away any sins and is said to please Lord Rama. There is a unique belief that the pilgrimage is not complete without giving money or food to charity to the needy. Small amusement park rides such as merry go rounds, the giant wheel are set up near the temple along with performances by acrobats and magic shows that take place throughout the 5-day event. Gurudwara Shri Tarn Taran Sahib was built by the fifth Guru of the Sikhs, Guru Arjan Dev. It is located 22 kms from Amritsar, in the village of Tarn Taran Sahib. The name 'Tarn Taran' was given to the Sarovar which means 'a boat that takes one across the ocean of existence.' Built in the Mughal style of architecture, the gurudwara is famous for having the largest Sarovar. The lotus dome that covers the three-storeyed building was damaged during the 1905 earthquake. The holy Gurudwara sees kirtan recitals every day which start from the early hours of the morning and lasts until late evening, which the visitors to the site have the privilege of witnessing. It is also immensely famous for the gathering of pilgrims on the day of Amavas. Vistors and pilgrims believe that the Sarovar's water has medical qualities and is also said to be capable of curing leprosy. The famous Gurudwara displays elegant stucco work reflecting on glass pieces and intricate designs on the ceiling and the inner walls. Only the upper section of the structure is covered in glittering gold sheets. The Guru Granth Sahib is placed on a platform under an elongated dome. This platform was an offering from Kanvar Nau Nihil Singh, Grandson of Maharaja Ranjit Singh. The main hall or Darbar Sahib of the building is plated in gold with a marble inlay. The flight of marble stairs behind this hall leads pilgrims to the spot where Guru Arjan Dev made the first cut for the digging of the magnificent Tarn Taran Sarovar in 1590. Over the years, additional buildings have been added to the complex. Pul Kanjari, popularly known as Amritsar’s Taj Mahal, is a village based on the vibrant expression of love by Maharaja Ranjit Singh. Situated close the Wagah border, this town is historically significant as Maharaja Ranjit Singh and his troops would rest here while travelling between Amritsar and Lahore. An important trading centre during the 18th century, the town was named after a small bridge built by Maharaja Ranjit Singh over the canal between Amritsar and Lahore for his favourite dancer Moran, a Muslim dancer from the nearby village of Makhanpura. The Government of Punjab has recently renovated and opened the gates for tourists to visit Pul Kanjari. Apart from the bridge, one can also admire the fortress of the Maharaja, which houses a Mosque, a Mandir, the Baradari and a Sarovar. A war memorial has been instituted to pay respect to the brave martyrs of the Indo-Pak wars of 1965 and 1971, during which time this area was greatly disputed over by the Pakistani Army and the Jawans of the Sikh regiments. Vistors can find beautiful Fresco work on the walls, and Nanakshahi Bricks were used to construct the Shiv Temple. Pul Kanjari was a major shopping hub during the partition era. After partition, inhabitants of the area who survived the aftermath migrated to parts of Chandigarh, Himachal Pradesh, Delhi and other parts of India. Every August sees the return of these people who come to pay their respect to their ancestors and perform Akhand path in memory of those who had lost their lives at this historical site. Gurudwara Baba Atal Rai is located inside the Golden Temple complex in Amritsar. The historic shrine was built in honour of Baba Atal Rai, son of Guru Har Gobind Singh. The 9 storey octagonal tower represents a year in Atal Rai’s life as he passed away at the young age of 9. Originally, a samadhi of Baba Atal Rai the building slowly began transformed into a Gurudwara. It is the tallest tower in Amritsar alongside the Kaulsar Sarovar. This architectural marvel is one of the most visited attractions in Punjab, with millions of pilgrims coming from all around the world. The tower houses many miniature paintings of the life and teachings of Guru Nanak, the first Sikh Guru. The last storey of the tower offers visitors a birds-eye view of the bustling town of Amritsar. Not just a symbol of glory and artistic richness, but it also stands as a reminder of the divine power of Baba Atal Rai. The age-old belief among the Sangat and devotees is that having a dip in the holy water of Kaulsar Sarovar brings mysterious wide-spread showers in Amritsar. 'Baba Atal Pakiyan Pakaiyan Ghal' is an old saying which means that Baba Atal Rai has sent us already cooked food. The langar at the Gurudwara serves the visitors 24 hours a day and is said to be the only continuous langar in Amritsar. This has been possible only through the volunteering service of Gursikhs. The ISKCON temple at Amritsar is an important site for the tourists among many other attractions in Amritsar. It was founded by The International Society for Krishna Consciousness (ISKCON), a Gaudiya Vaishnava religious organization. This temple, also known as Sri Sri Gaur Radha Gokulananda Temple, is located at the heart of the city. ISKCON is also at a walking distance from the world famous Golden Temple. The ISKCON temple is open to all. Hence, tourists and families are equally welcomed here. There are regular prayers conducted here and all the visitors are given Prasad free of cost. One can buy spiritual books, pictures of gods, T-shirts and other items from the stalls put up in the temple. The temple is located near other attractions like golden temple, Jalianwala Bagh and Wagah Border among others. The best time to visit the place is during the winter months stretching from November to March.